One of the most important parts of car upholstery maintenance is protecting and taking good care of the leather in your car. Leather is one of those materials that is really awesome to look at, feel and appreciate, but if not properly taken care of, it is very delicate and the damage will cost you a lot in repairs. This is why you need to get the best car leather cleaner to take care of your car’s leather interior. For most professional auto detailers, the procedure and necessary equipment for cleaning leather seats are some of the most common questions that they come across. There has been a lot of misleading advertisements and bad information all over the place, which a lot of people interestingly enough tend to rely on. As a result of this, most people do not really know what to do if they need to clean their leather interior. From professional experience, we have also noted that a lot of people are usually eager to skip the basic requirements of proper leather cleaning, and go into protection and leather conditioning. There is also the misconception that when you use the right car leather conditioner, you will almost immediately transform terrible leather into good leather. By now you probably know there are so many products available. You can therefore choose from the variety, that which will work best for you. 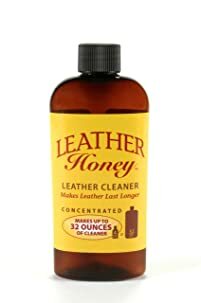 Leather Honey’s Leather Cleaner is perhaps one of the most versatile cleaners you will come across in stores today. Other than just helping you clean your car, it is also effective for other tasks, such as cleaning saddles, furniture, faux leather, and so many others. For its versatile nature, it works well with finished and unfinished leather. It is designed from natural ingredients, meaning that it will not harm your skin or any of your leather surfaces. If you worry about color change, it will also not cause change in color, or the texture of your upholstery. So, what makes it a good option for your car? The following are some of the key reasons why you should consider this product. Good customer reviews since 1968. The premium concentrated formula from which it is made is designed to help you get rid of oil, dirt, grime and stains fast and effectively. Other than this, the non-toxic ingredients also ensure that when in use, you do not need to worry about discoloration of your upholstery. In the event that you are not sure of the best leather cleaner for your car, this is perhaps the safest alternative for you. That being said however, you still need to make sure you dilute the cleaner with water before applying it on to the car’s leather interior. The small bottle can yield up to 32 ounces of cleaning liquid for your upholstery, which means that you can actually use it for years, hence an incredible value for your money. When it comes to car detailing and conditioning, Meg’s products usually are rated top of the pack by a lot of car owners. Thanks to the UV ray inhibitors, this product is particularly awesome for your car’s interior. However, you can also use it for other leather surfaces in the house. 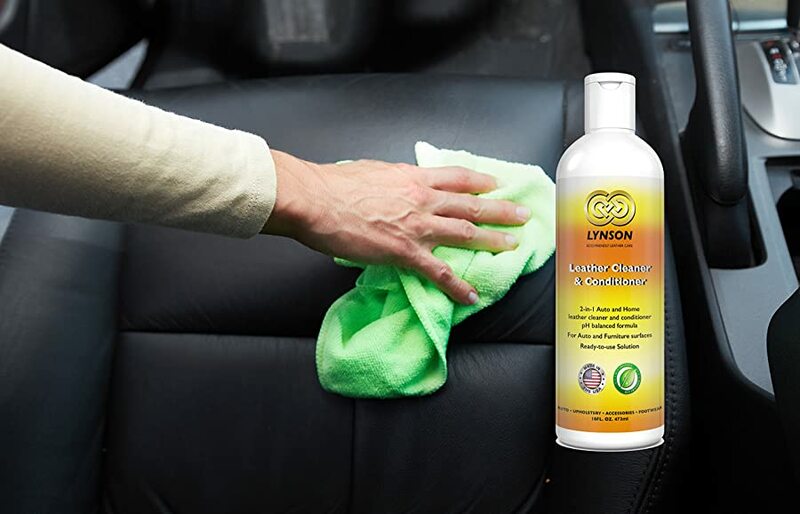 When you get this product, you will enjoy the one-step protection, which cleans, protects and conditions your leather upholstery, all in one step. You only need to spray it on the leather, wipe it and you will be good to go. This also makes it very good value for your money, it offers all the benefits you desire, without necessarily having to purchase two different products (cleaner and conditioner). The cleaner has an aloe spray formula, which gives it the feel and texture of a conditioner. Therefore, it will not leave any greasy residue or streaks on your car’s interior. Other than that, it has an awesome smell that will last all through the day. This is another product that is known for its versatility. You can use it on so many leather surfaces other than your car’s interior, including furniture, shoes and bags. It is designed to be safe from all plastic, leather and vinyl products, and there are no dangerous ingredients or detergents in the formula. It can easily penetrate the pores of your leather, to remove the oil, grime or dirt that might have set in. According to manufacturer specifications, it can also get rid of the stains that are left behind by other cleaners – must be some cleaner this one, right? You do not need to worry about discoloration or dullness on your leather surfaces from time to time. If your leather upholstery is treated with essential oils, it will not interfere with those either. You do not need to worry either about soapy residue, or oily residue that often remains on the seats after you are done cleaning. Dodo Juice, unlike other cleaners, does not promise to moisturize your leather. However, it offers an awesome protective finish, which repels water droplets. There is no sticky surface either when or after you are done using it. The leather feels smooth and soft. In terms of the cleaning capacity, it gets rid of most of the grime on the leather surface. Even for everyday stains like ballpoint pen ink, it clears such very easily. Therefore, this is one cleaner that will definitely meet the needs of the everyday driver. There are so many other affordable options that you can chose from, particularly if you are conscious about the amount you need to spend on your leather cleaner. Depending on how dirty your car leather is, there are some recommendations that will help you get through the cleaning process effectively. As the leather surfaces that you have in your car age, they will lose the original protectants that are infused into them in the course of the manufacturing process. Because of this reason, the leather will become easily affected by oils, dirt and more importantly damage as a result of exposure to UV rays. It is often tempting to make the assumption that since your leather upholstery seems to be tougher than the normal fabric, it does not need to be looked after. What most of us do not realize is that this leather material should also be nourished and properly maintained for it to stay looking as good as new for longer. Just like the two bucket procedure for cleaning your car, there is a two-step cleaning solution that you can use with the best car leather cleaner. You should use a pure cleaner, one that is free of silicone oils, gloss agents or petroleum solvents. Use a microfiber applicator pad to help with this, or a scrub brush that is gentle on your upholstery. Remember, when you are working on this leather, you are not supposed to scrub, but agitate the fabric. Agitation is important because it allows dirt and other body oils to come to the surface of the leather, by opening up its pores. Once this is done, you can then wipe them away easily. After cleansing thoroughly, we move to step two, applying good quality conditioner on the leather. Make sure you use good quality conditioner. Market leading conditioners are designed to moisturize and nourish the leather. Look for conditioners that are engineered at molecule level, specifically designed to absorb into the fiber cells. Through this action, the fibers will be able to maintain their resilience, hence preventing premature aging. With the right conditioning, the fibers will maintain their softness and flexibility. If you are the type of car owner who goes after the inexpensive brands in the market, you have to be very keen. Most of these leather conditioners usually have petroleum distillates, silicone oils or silicone itself, and some gloss agents. These will cling on to the surface of your upholstery and are transferred to your clothes. They will therefore leave you with a terrible greasy finish. To be on the safe side, always make sure you choose a conditioner that is water based, and has a balanced pH rating. Always read the manufacturer instructions before use. If your leather is to remain as beautiful as it is, or was when you bought the car, it has to be cared for. Cleaning and conditioning are some of the most important things that you will need to pay attention to. It is in fact easier and cost effective for you to spend some time conditioning and protecting your leather upholstery, than having to spend more money and energy on the salvage process. You no longer have to worry about leather that remains dried, looks to have aged prematurely, or cracked. If you do not offer the appropriate care for your leather, it will soon lose its luster and flexibility. Take note that the deterioration process is usually faster in areas where the climate is warmer. However, with the best car leather cleaner for regular cleaning and conditioning, you are able to keep your car’s leather soft, supple and looking fresh for a very long time. Get more information about the About Care Your Car here!